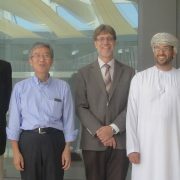 HALBAN To enhance its internationalization the German University of Technology in Oman (GUtech) has hosted three high-ranking representatives of Nagoya University (Japan) on its campus in Halban. Dr. Yoshihito Watanabe, Trustee and Vice-President for International Planning and Public Relations as well as Prof. Dr. Eng. Nakamura Hikaru of the Department of Civil Engineering and Takako Sakaki, Head of the International Student Exchange Section and the International Affairs Department visited GUtech during the past two days. They were welcomed by the Rectorate of GUtech and the Heads of all academic departments as well as the International Office. “We wish to cooperate with our Japanese colleagues in the scientific fields of Engineering, Architecture, Computer Sciences and Geosciences and promote a regular bilateral student and academic exchange,” said Prof. Dr. Michael Modigell, Rector of GUtech. In a second step GUtech representatives are planning to visit their Japanese counterparts in the coming months at Nagoya University. Six Nobel laureates who were awarded in Physics and in Chemistry since 2008 have been conducting their research at Nagoya University. The visit to GUtech was initiated by a visit of Prof. Dr. Hiroshi Amano, the Nobel Prize Winner in Physics in 2014 to GUtech in January this year. At that time Prof Amano gave a public lecture on his research journey and LED lights at GUtech. Nagoya University currently has 16,438 students including around 3,000 international students, most of them from Asia but as well from Europe. Initially, Nagoya University was founded in 1871 as a temporary hospital and as a medical school. In 1949 Nagoya University was established and in 2018 the university became a designated National University. Nagoya is located around 1.5 hours by train from Tokyo. With 2.2 million inhabitants Nagoya is the 3rd largest city in Japan. 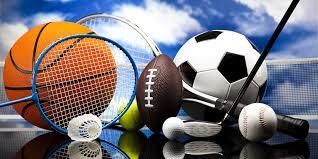 The university has strong links with international companies such as Mitsubishi Heavy Industry. More than 100 international companies are located close by the university in Nagoya. Nagoya University offers six international undergraduate and 11 post-graduate study programmes. In addition, during summer the university offers a 6 week programme on the Latest Technology and Tasks in Automobile Engineering for BSc and MSc Engineering students. In recent years the university has created a number of new research labs and development centers for open innovation, such as the “Institute for Advanced Research” or the “Institute for Innovation for Future Society”, for practical research. Through research at the “Mobility Innovation Center” at Nagoya University researchers plan to empower an increasingly ageing society through advanced mobility support such as autonomous cars or walking assistance robots. Further research centers are the “Green Mobility Research Institute” (GREMO) and the Disaster Mitigation Research Center (DMRC). Moreover, Nagoya University has been expanding the scope of employment possibilities for female researchers. Consequently, the university was selected as the only Japanese university to be among 10 universities worldwide to support the “UN HeForShe Camapaign”. 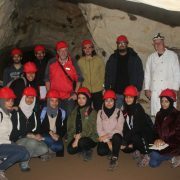 MUSCAT The Department of Applied Geosciences (AGEO) at the German University of Technology in Oman (GUtech), recently conducted a two weeks international excursion to Germany with a group of 12 students, their professor and an assistant. The study-trip is part of the AGEO curricula, with its main goal to learn more about the geology of Germany and the regional development of the region between the cities of Aachen and Cologne. “The students had to familiarize themselves with different aspects of applied geology such as the development of natural resources or the usage of ground- and sub-surface water in the lower Rhine district. With a focus on the presentation of thermal springs, coal and base metal deposits as well as volcanic rocks, we give the students an overview of geological topics that cannot be presented here in Oman,” said Prof. Dr. Wilfried Bauer, who headed the excursion. In the second part of the excursion the students learnt more about the socio-economic development of a region, that developed from an industrial area based on lignite and coal mining region to a more diversified economy today. The group visited the geological garden and the mining museum in Bochum in the heart of the former mining district along the Ruhr river. “Although coal mining will be closed at the end of this year, the production of steel and other metals will continue with cheaper imported energy resources since the skills and know how is still there.” said Prof. Dr. Bauer, who is specialized in the mining sector. The students visited different German cities like Cologne, Bochum, Xanten, Aachen and Spa in Belgium. At GUtech’s partner-university, RWTH Aachen University, they were welcomed by the international office and informed about Master and PhD programmes and they had the opportunity to attend a lecture in the MSc programme in Applied Geosciences. In recent years, several GUtech students have conducted their research for a Bachelor project at RWTH Aachen or pursued their MSc studies in the Geosciences department. “We continuously need to maintain our excellent links to universities in Germany and in other European countries. This collaboration and cooperation is the best way to link our young Omani graduates with the international research community,” said Prof. Wilfried Bauer.